Linda Mar Veterinary Hospital is proud to introduce Class IV laser therapy for your pets. It has many beneficial uses, including reducing chronic pain, speeding up healing time and rehabilitation post surgery, and much more! 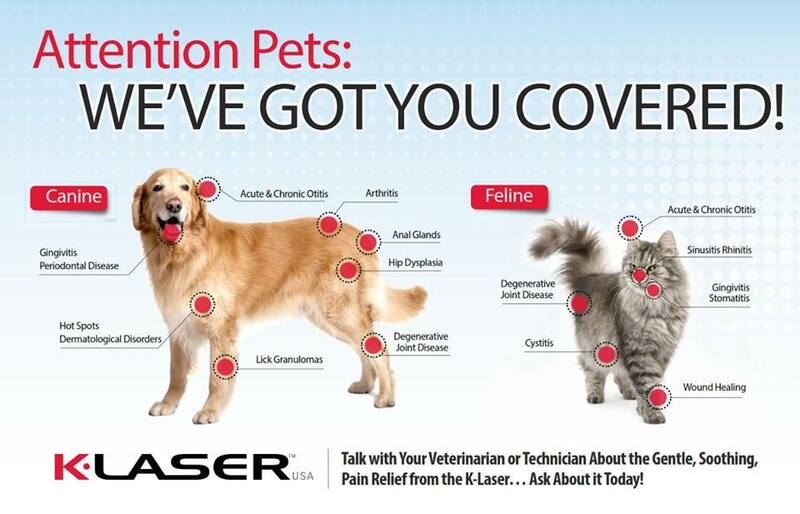 For both cats and dogs, laser therapy can be part of the solution to help ease your pet’s discomfort. Safe and effective, this new treatment provides increased comfort and mobility as well as accelerated and improved wound healing and rehabilitation. We are pleased and excited to be able to offer this treatment to our patients. For more information on laser therapy, please see below. If you think your pet could benefit from this treatment, or if you have more questions, please give us a call to set up a consultation. Please do not hesitate to call us with any questions you have about laser therapy. Class IV laser therapy is the use of an intense beam of laser light directed into tissue to promote healing, and reduce pain and inflammation. Electromagnetic energy interacts with the tissue both chemically and biologically to produce the healing effects. Lasers produce a single (monochromatic) wavelength in an orderly straight line, which allows for deep tissue penetration and the ability to accurately target the area to be treated. When the laser is directed at your pet’s tissue it increases circulation by stimulating an endorphin release, which reduces pain and inflammation. The laser also radically excites the cell’s energy carrier (the ATP) to heal the cells in 1/3 to 1/2 the normal healing time. Laser therapy is most often used to treat inflammation, pain or acute trauma, as well as any chronic condition which causes pain and/or stiffness resulting in reduced mobility. The effects produced by laser therapy are cumulative and need to be built up over time, especially with chronic conditions. Some pets may show signs of great improvement after only one treatment, but generally several treatments are needed to gain maximum benefits. The number of treatments needed varies based on your pet’s condition. When is Laser Therapy Beneficial? Pain Management: Laser therapy is a non-invasive therapy that can be used in addition to or instead of prescription medications for the treatment of chronic pain. Wound Healing: Laser therapy can significantly reduce healing time. It also helps to create stronger tissue and less tension and scar formation. Surgical incisions and traumatic skin wounds gain many benefits from laser treatments. Rehabilitation: Musckuloskeletal injuries and orthopedic surgeries usually require extensive physical therapy or rehabilitation efforts. These can be supplemented with laser therapy for a quicker recovery. Complement Other Treatments: Laser therapy is often used in conjunction with other forms of therapy, such as physical therapy, acupuncture, and chiropractic adjustments, as well as post surgery. Using laser therapy in conjunction with these and other treatments can increase their effectiveness. Restraint and sedation are generally not required, and most pets find the experience to be pleasant and comforting. Your pet may feel a mild, soothing warmth or tingling at the treatment site, but most often they don’t feel a thing. You can be present during the procedure, but must wear protective eye goggles (which we will have here). The initial consult and treatment will be scheduled with a doctor. At this time, he/she will recommend a treatment plan that is tailored to your pet’s needs. Depending on the condition being treated, your pet will need between 2 to 8 sessions. Unless otherwise noted by the doctor, these follow-up sessions can be scheduled with a technician. Frequency of treatment varies based on the condition being treated. The length of time for each treatment session varies based on condition and size of treatment area, but most are between 2 to 8 minutes long per site. You may see improvement after only one session, but most patients need multiple treatments to get the maximum benefit. Even if your pet seems better, you should complete the entire course prescribed by the doctor, just as you would if your doctor prescribed a course of antibiotics. Do not expect 100% resolution after only one treatment. While you may see some signs of improvement, the effects of laser therapy need to build up over time to provide the maximum benefit to your pet. Do not expect a cure for arthritis. Do not expect a major change in how your pet walks. An awkward gait will not disappear overnight, and may not entirely clear up at all, depending on the condition. DO NOT increase activity for your pet. DO take it easy for a while. You want to give the treatments time to work. DO NOT “test” to see if the laser worked. For now, strenuous play, such as fetch, is off-limits. DO watch your pet for signs of improvement such as going up and down stairs more easily, renewed energy, lack of hesitation when getting in and out of bed, and for wounds, rapid tissue healing and less biting & scratching. DO consult your doctor before allowing your pet to return to full activity. Activity and exercise must be reintroduced slowly to avoid aggravating the condition. DO NOT stop treatments after only 2 or 3 sessions if you do not think the treatment is working. It takes time for inflammation to go down and for tissue to heal. DO call your pet’s doctor to discuss any concerns you may have about how well treatment is working. They may want to have you schedule your next treatment with them so they can determine if the treatment plan needs to be adjusted.